This upcoming Sunday, February 26th, millions of people worldwide will turn their televisions on to catch a glimpse of the glitz and glamour of Hollywood on the broadcast of the 84th annual Academy Awards. Who will take home the Oscar? Press book clippings reveal a story that could surely rival any award-nominated screenplay – a plotline of crime and betrayal in a gallery caper that went unsolved. The leading role in this gallery mystery was in fact not an award… but a cat. 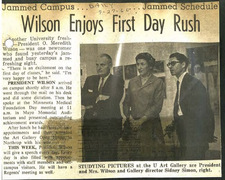 As a result of the incident, a hostess system was implemented wherein volunteers from the Faculty Womens club staffed the Fine Arts Room. For many years, it has been known, as the story goes, that one of WAM’s Georgia O’Keeffe paintings, Oriental Poppies, “may have been selected for purchase by popular vote.” So reads the label that describes this painting, currently on display in WAM’s Woodhouse Gallery. The story, told by WAM tour guides, and believed by staff and visitors for many years, unfolds simply like this: An exhibition of the work of artists represented by gallery owner and dealer Alfred Stieglitz was held at the gallery in 1937. Visitors to the exhibit voted for their favorite work. Oriental Poppies won. This story… however… is a myth. 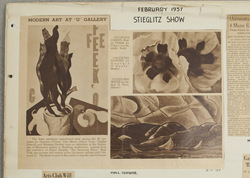 In February of 1937, the Gallery did exhibit a Stieglitz show, which showcased the “famous five” from his gallery at An American Place – Georgia O’Keeffe, John Marin, Charles Demuth, Arthur Dove, and Marsden Hartley. Amongst the 40 or so canvases in the exhibit was Oriental Poppies by O’Keeffe. 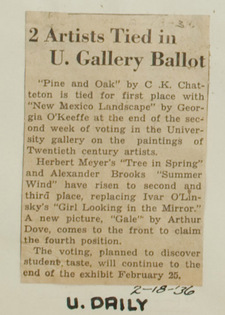 There was, however, no popular vote of the visitors to select a piece to be purchased by the University. A vote did take place, however, amongst the members of the Fine Arts Committee, a body on campus that oversaw the gallery and other issues related to the arts on campus. Their unanimous vote was an agreement to make a formal request to President Lotus Coffman to purchase Oriental Poppies. 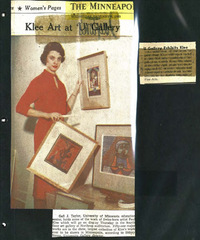 Correspondence found within the folder titled, “Fine Arts Committee” in Box 110 of the WAM collection reveals the details behind the acquisition of the painting upon the insistence of the Committee. In February of 1936, one year prior to the mythologized 1937 Stieglitz show, the gallery mounted an exhibit titled, “The Twentieth Century,” which contained representative examples of contemporary works loaned to the gallery, some of which included artworks lent by Stieglitz. 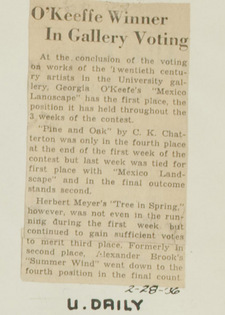 O’Keeffe’s piece, New Mexico Landscape won first place in the three-week contest. 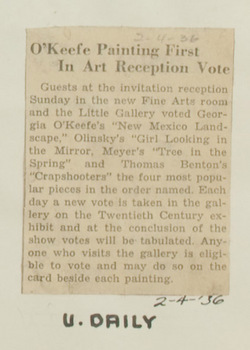 While there is partial truth to this myth – that a vote was involved in selection and purchase of Georgia O’Keeffe’s Oriental Poppies – it was a unanimous recommendation of the Fine Arts Committee in 1937, and not a democratic visitor vote, that resulted in the acquisition of the painting. 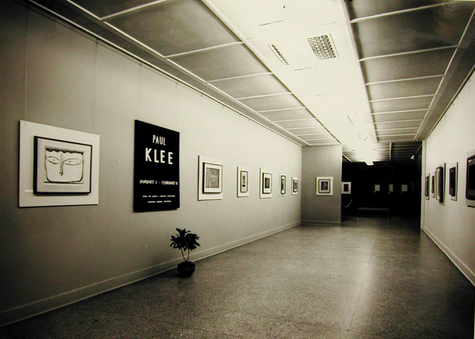 Regardless of the specifics, what these two February exhibits clearly show is the popp-ularity of Georgia O’Keeffe at the University of Minnesota. 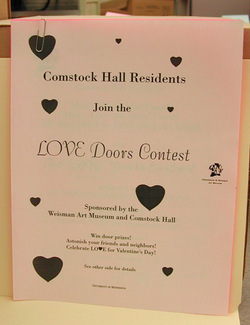 “The Weisman Art Museum and Comstock Hall are sponsoring a door decorating contest to coincide with Valentine’s Day in conjunction with the museum’s exhibition, Deck the Halls. Personalize your door with designs, images, and objects that convey some of your ideas about LOVE. Feel free to express yourself about more than just romantic love. Gift certificates to the Weisman Museum Store of $100, $75, and $50 will be awarded to the top three LOVE Doors. Doors will be judged on Monday, February 12 by a team of experts: Colleen Sheehy, Director of Education at the Weisman, Michael Baynes, Comstock Hall Director, and Kim Grocholski, Comstock Hall President. Winners will be announced Tuesday, February 13. You must follow the resident halls regulations about door decorations (e.g., only 2/3s of the door can be covered; no electricity can be used; nothing can be affixed permanently to the door.) Please check your residence hall handbook or consult your resident assistant. Doors that do not adhere to the regulations will have to be disqualified from the competition. The Files do not provide insight into the winning Door design from this 1996 contest… I wonder who created the best “Love Door”? “Don’t open boxes.” This was the dry reaction of a WAM staff member after I had shared my find of a large box full of 13 binders in a storage room at the museum. The binders were each titled, “press book” and were dated by academic year. As I wiped away a few centimeters of dust off of the cover of the first binder, I was hopeful yet hesitant at what I would find. It was more than I expected. Newspaper clippings, photographs, press releases, posters, opening invitations…. oh my! 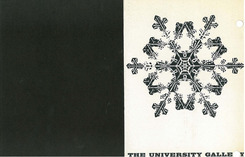 Each binder contained an explosion of ephemera covering exhibits and programming at the University Gallery from approximately 1957-1969. Each piece was neatly placed on pages and covered with clear plastic sheets. This find came at an interesting time, as it happened just one day before I finished processing and documenting the last box, #218, of the WAM Collection at the University Archives (more on this later). But although I have reached the last box at the Archives, through the simple act of opening boxes at WAM, I realized, as long as there is a WAM, there will always be more boxes to open. I must now in good faith scan the pages of the press books to create digital versions, and then dutifully prepare the press books to be transferred to the Archives to be preserved in future “last” boxes… 219… 220… and so on. 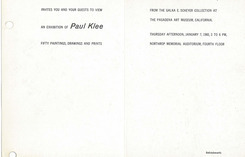 From January 7 to February 8, 1960 the University Gallery exhibited paintings, drawings and prints by the artist Paul Klee from the Galka E. Scheyer Collection at the Pasadena Art Museum, California. “… There is a strong element of whimsy and design for design’s sake in his work, but the essential content of his prints, drawings and paintings is the nature of the world and man. In an exhibit of his work now at the University Gallery, Klee sees man as a victim of his environment (“Swamp-Water Sprite“) and his desires (“The Lover“), and by nature a vulgar, grotesque and foolish creature. Even the artist’s rather sympathetic depiction of the human situation in “Tightrope Walker” shows man as somewhat of a clown, moving intrepidly onward simply because there is nowhere else to go…. kcovey on And then… there was one.